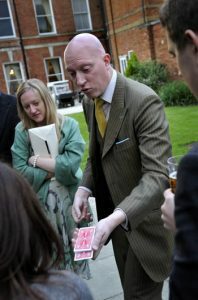 Robert is a Professional Basingstoke Magician, Mind-reader and Demonstrator of Extra-Sensory Curiosities, and works regularly at Audleys Wood Hotel. He entertains with demonstrations of sleight of hand, memory feats, psychological reading and hypnotic suggestion. His natural wit creates an exciting, fresh, lively and intellectually stimulating genre of entertainment. Perfect for creating a talking point at any event! 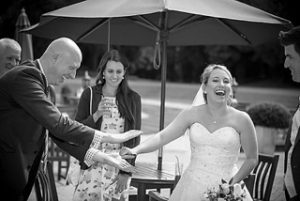 Robert is the recommended magician and mind reader for Audleys Wood Hotel, one of the top venues for corporate events and weddings in Hampshire. Audleys Wood is a great venue, only a couple of minutes away from the M3 (so easy access from London and the rest of the country); however, it is located close to the Hampshire town of Basingstoke, and about 30 minutes drive from Winchester to the south, and Reading and Newbury in Berkshire to the north. Remember to quote “AUDLEYS15” when booking Robert for your event at Oakley Hall Hotel for a 15% discount from his standard package options. 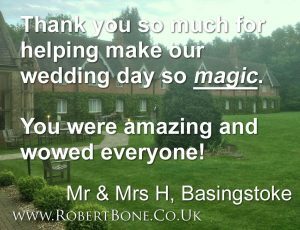 Contact Robert now to discuss how he can make your event a magical occasion. Email robert@robertbone.co.uk or call direct on 07930 420 257, remembering to quote “AUDLEYS15” for your 15% discount.